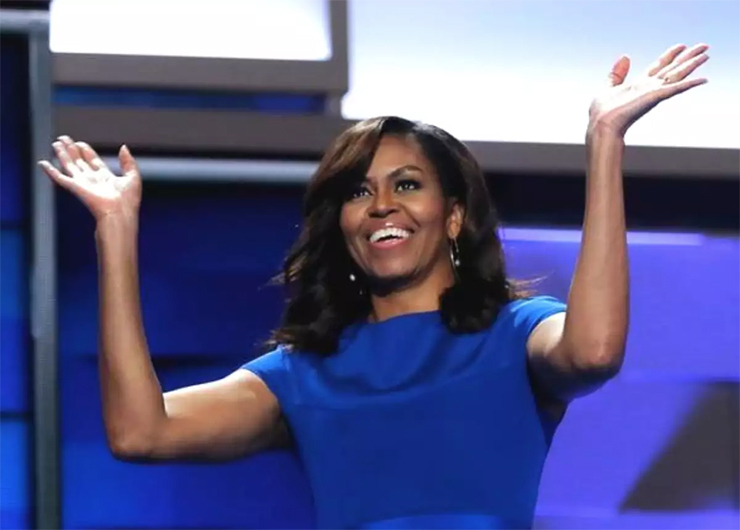 Michelle Obama reveals how an American icon is the symbol of striving for a work-life balance. A friend of mine says she would never forgive Michelle Obama for not campaigning on behalf of Democrats during the crucial 2010 midterms, when the party lost the House. As her excellently written memoir makes clear, the First Lady mostly dislikes politics, so her non participation back then was not a surprise. It is telling that Michelle Obama devotes two-thirds of her book to the years before the White House, and only one third to those eight years. Moreover, that last third is the least interesting part of the book. Ultimately Michelle sublimated her own ambitions to her husband’s. It is a complicated and fascinating journey that could have been scripted as fiction by someone like Tayari Jones. It’s about a lawyer turned nonprofit star who gave up a great career at its apex, when she was a vice president of the University of Chicago Medical school, to become First Lady, which she dismisses as “a sidecar” to the presidency. And it co-stars her mother, Marian Robinson, as the mostly unsung heroine of her journey. There is much I did not know that’s illuminated in this compelling title. She grew up on the South Side of Chicago in an ordinary working-class home. Her father, despite increasingly disabling multiple sclerosis, never missed a day of work at the city’s water filtration plant. Her mother was a homemaker during their childhood. Her extended family was always close—her grandfather, nicknamed Southside, taught her about R&B and jazz. Her great-aunt Robbie, who lived downstairs in their two family home, taught her and brother Craig the piano. Her first elementary school teacher was so bad that Marian Robinson managed to get her moved to a gifted and talented class. Her magnet high school prepared her and her classmates, like Jesse Jackson’s daughter Santita for higher learning. Following her basketball-star brother, she enrolled in Princeton, where in 1981 only 9 percent of the students were black and men outnumbered women two to one. A would-be New Orleans roommate’s mother was so horrified that she insisted her daughter be moved away from the tall black woman from Chicago. She did well in school, finding her niche at a multicultural club. Although she went to Harvard law school she skips any account of her time there. Instead, we see her next at a white shoe Chicago law firm. As a first year associate, she saved money by living at home. She was soon asked to mentor a much-admired intern who had just finished his first year at Harvard Law. His name was Barack Obama. After he graduated as first black president of the Law Review and returned to Chicago to work for a different firm, they became a couple. The box-checker wanted to get married; Barack couldn’t see why. But finally, at a romantic dinner, the dessert arrived, and when she lifted its silver lid, she found a box with an engagement ring. She left the law firm to work at City Hall for an important new woman in her life, Valerie Jarrett. And Michelle and Barack made a pilgrimage to Kenya to see his father’s ancestral home. A revelation was at hand. She expected that she’d feel a bond with a place she imagined as a “mythic motherland,” as if going there would lead to “some feeling of completeness.” She realized, however, that Africa “owed us nothing. “Barack was more at home. “It’s a curious thing,” she writes, the “in-betweenness one feels” of being African American in Africa.” It made her a bit sad. Michelle took a new job at a nonprofit, Public Allies, a sort of Teach for America to mentor young people for community jobs, after they married. Thus began her journey to seek the right professional fit for her ambitions and her heart. Barack, meanwhile, began his first political race, for state senate. She did not think it a good idea. “I just believed there were better ways for a good person to make an impact.” She thought “he’d get eaten alive.” He was elected and spent weekdays apart, in Springfield. From Public Allies she went to the University of Chicago as dean of community affairs. Next, to the University of Chicago Medical School. Along the way, she had a miscarriage, which she deals with quickly in the book, noting that it was important for other women to see how common miscarriages were. The couple turned to to in vitro fertilization to conceive first Malia, then Sasha. Barak lost one race for a congressional seat. He soon considered running for the U.S. Senate. Frustrated at their lack of time together and lack of communication Michelle suggested couples counseling. At first, she said, Barack was reluctant. Wasn’t there a book he could get about relationships? But they did go, and Michelle writes that it helped “loosen the knot” that she felt was strangling her. She had much to learn during the 2008 nominating campaign. There were more slings and arrows—the overreaction to the casual fist-bump between the Obamas, however, really hurt. Campaign advisor David Axelrod had to counsel her on optics; she pushed back and got a bigger staff and her own plane. More and more, her mother had to look after the girls. I enjoyed the little touches she adds about her time entering the White House. Barack’s Secret Service code name was Renegade. Hers was Renaissance. Since the girls could choose their own, Malia was Radiance and Sasha Rosebud. Marian became Raindance. Marian said the White House reminder her of a museum; “how do you sleep in a museum?” But she joined the family there. The first daughters were thrilled, since Marian was easier on them than their mom. There were good times in the museum, like “sneaking” off to New York for dinner and a show, and planting the White House garden so she could put vegetables on her signature campaign plate for kids diets. But Michelle and the children chafed at the suffocating presence of security. She couldn’t even open a window! And she rebelled over the massive advance planning that went into going for ice cream, or a simple visit by Malia to a friend’s house. The First Lady acquired a personal wardrobe stylist and a hair and makeup person (she paid for these herself). The truth, she says, is virtually every woman in public life also has such helpers. She aimed for programs of substance like a mentoring group, using the White House female staff to link with outsiders. Mostly her discussion of the years in the White House is a tale of trying to slip out of the bubble and do mundane things like shopping, or hanging with girlfriends over wine on a Camp David weekend. She preferred to read People magazine and watch Oprah and Ellen rather than political shows. A highlight of trips overseas was meeting Nelson Mandela. Her remembrances of Britain are hilarious. She really enjoyed Queen Elizabeth II. The two shared sore feet from their respective shoes. Michelle even unknowingly breached protocol by putting her arm around the old lady. She says she rehearsed weeks for her time on Carpool Karaoke. (And wasn’t she great in that appearance? It made me—and others—just adore her.) A low point in the Obama presidency was the Sandy Hook massacre, the only time in eight years, she tells us, when Barack asked her to be with him midday in the Oval Office. Donald Trump? She is brief and justifiably nasty. She’ll never forgive him for the “birther” controversy, where Trump had questioned whether Barack was really born in Hawaii, not Kenya. She was disbelieving at the ugliness of the Access Hollywood tape. How, she asked could so many women vote for a misogynist and bully? As I finished this book, I understood her deep dislike for politics and how she exhaled, finally, upon leaving the White House. I believe her when she states has zero interest in running for office, ever. Still—a White House legacy of healthy breakfasts for kids? Really? Surely she wants to contribute more to the world, on her own terms. At age 54, Michelle Obama has a lot of life to live. There’s no indication beyond her current rock-star book tour what she’ll strive for next. Read her substantive memoir for a detailed, honest look at the hard work and considerable thought beneath the graceful exterior of an American icon in her prime. 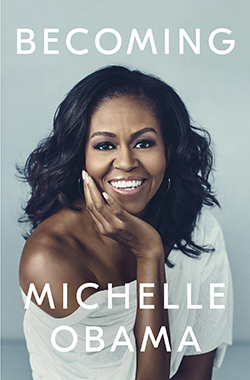 BECOMING, By Michelle Obama, 426 pages, Crown Publishing, $32.50.